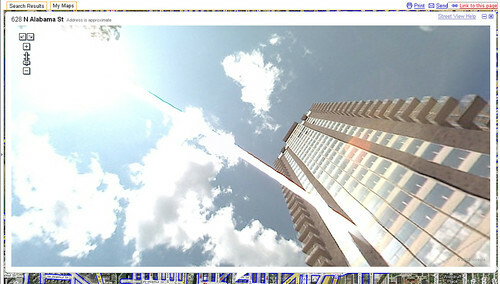 i was looking up a place downtown where we have to go tomorrow when i noticed a new google street view option. if you're not familiar with the service, google (and their subcontractors) drive around town in a van with a specialized camera on top that takes 360-degree panoramic photos. these are all stitched together with google maps so you can navigate around town at a "street-level" view. it's quite handy if you need to go somewhere you've never been, as you can plonk in the address and see exactly what the place looks like. when google first rolled out the service in may/june, i spent a good day or two browsing around san francisco documenting glitches. but at that time, it wasn't available in indianapolis. maybe better geeks than i already knew it had been rolled out here, but i never heard anything about it. so go to google.maps.com. enter in your favorite address—be it your house, the home of the person you're stalking, your local pea-shake, whatever. if you see a blue outline around the street, click it and take a look around. I think Google Earth is waiting for the Banks to be completed. Whst is it with the whole no vehicle in view thing? No car is ever on these streets, and even the '76 El Dorado in my front drive is not there on my street view. That cruise liner has been docked there for 2 years. No cars, no people...how do they do that? i'm guessing they drove around sometime when a lot of people weren't out, like saturday mid-morning. There are the occasional people - they managed to catch me weeding my yard. note to indy star: hire more editors!